My scanner has arrived, and in time for me to try it out before I head off for a few days away next week. I’ve started with something small, the Noctropolis cluebook. I’m still unclear how involved Origin were with anything to do with Noctropolis but the book is now available to download from here and I’ll also add it into the downloads page. The scanner is looking good so far. It may have been cheap but scanning this in took next to no time, left my book unscathed and I didn’t have to edit any of the images before generating the pdf. Above all, the quality is a huge improvement on what I’m used to. 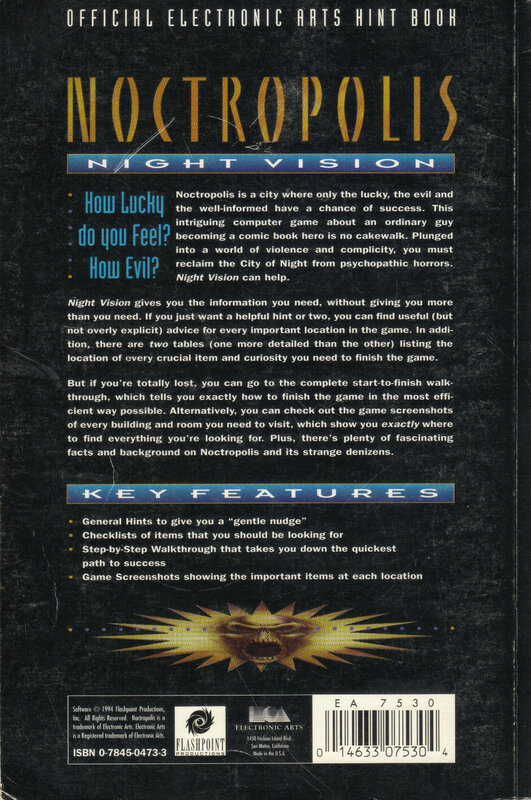 It’s not clear how much involvement with the game Origin had but the Noctropolis clue book was definitely published by them in 1994. I picked this cluebook to look at tonight because I figured there wouldn’t be much content and I’d rattle it off quickly. There was considerably more than I was expecting though. It’s a fairly lengthy 96 pages, which start out with the usual sections to help you through the game, such as questions and answers for each location, a list of items and where to get them and a full step by step walkthrough. 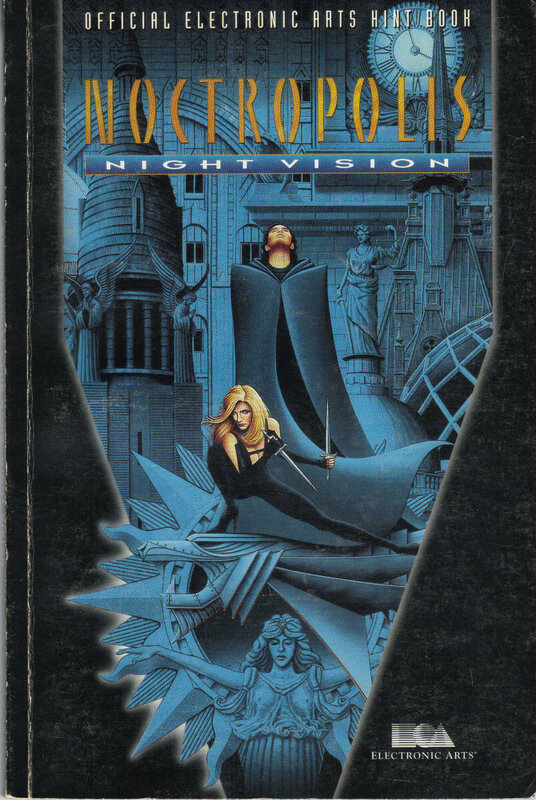 The latter 60 pages however are an illustrated tour of Noctropolis with screenshots of every game location (with interactive hotspots shown), and some sort of clipping below relevant to it. These clippings are written as though they have been pulled from newspapers and other documents. To give a few examples, there is an advert for your bookstore at the start of the game, the police file on Stiletto and the transcript of an interview between Dr. Macabre and his psychologist. All of the clippings are well written and exactly the sort of thing I’d like to have seen in the original documentation. None of them give anything in particular about the game away but they would have set the scene very nicely and take a tongue-in-cheek approach to the world of Noctropolis. I wonder if maybe these are from some extra documentation originally intended to ship with the game and it got pulled. It’s certainly the sort of content that I’d have expected to see in a mock newspaper or something similar that you saw in some games around that time. The book ends with the transcript of Darksheer’s farewell speech to the city where he talks about his craving for the light. This might have made the ending even more obvious I suppose but I’m sure anyone who plays the game could see it coming a mile off. As for the screenshots, I used these a bit during the game as the interface gave no indication on which areas of the screen you could interact with so it saved plenty of pixel hunting. They certainly made it more fun for me, without actually giving away puzzles entirely. In short there is nothing earth shattering in this book but it did add some value to the game. I wouldn’t have needed the screenshots with hot spots if the games interface had been better, and most of the rest of the content would have been more relevant if I could have read it before I played the game. Most of this arguably should have been included with the game in the first place but I would guess that costs needed to be kept down, and I did get the comic book included so I shouldn’t complain.